Once a week, Elsa Brantenberg hosts the Saint Charles Quilting Circle at her farmhouse on the outskirts of the riverside town of St. Charles, Missouri. The ladies who gather there have all lost men to the Civil War, and are facing their painful circumstances together in friendship and prayer. Can the tattered pieces of their hearts be stitched together by God’s grace? “Welcome to St. Charles, Missouri. The Civil War has been devastating to some of the women here and three of these women meet for quilting over at Elsa Brantenberg’s farm. When they all come together it is more like a support group and each woman gets her own story. 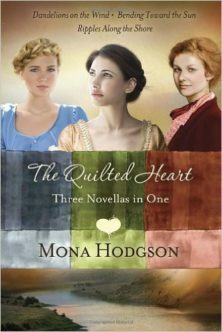 “Mona Hodgson’s wonderful characterization brings the characters of The Quilted Heart to life. Each character is special and their life stories are beautifully quilted together in this novella collection.